Doncaster v Portsmouth: They said what? POMPEY drew 0-0 in their trip to Doncaster Rovers in League One today. Here’s what those closest to the action had to say. We lost here last year and we lost at Bristol Rovers as well so we have four points out of six on the road. We have to be pleased with that. I felt the first half belonged to Doncaster and we needed to improve. We created the three best efforts of the game and were unlucky not to score those. We did improve in the second period, we did need to or I felt the game would slip from us. We’re creating the chances but the goals haven’t been there today, don’t panic because they will come. I’m disappointed that we couldn’t do it for the fans today, they were fantastic throughout the game and I’m glad they showed the appreciation for the team at the end. The red card isn’t something you prepare for, credit must go to Ben Whiteman for stepping up and going on goal. We set up to play in a certain way, Portsmouth will come away from here happy with a point, their keeper has made some good saves, we just need to find that scoring touch and turn the chances in to goals now. Overall looking at the game a clean sheet and a point is a good return. But we had some good spells after the break and they were down to 10 men at the end, so there's a hint of disappointment around. It's in our nature to want to go out and win games, but taking a step back and looking at it it's a good point. Pompey's league winning streak ended with a fascinating goalless draw at Doncaster. Kenny Jackett's men should have been defeated in the opening 45 minutes as rampant Rovers seized control. But substitute Ben Close transformed the Blues and it was they who dominated after the break. Evans was brilliantly denied by Marko Marosi, the keeper later sent off, but there was no way through as both sides shared the points. There were mixed feelings about Pompey's point at Doncaster today. The result meant Kenny Jackett's men couldn't equal the best start to a season in the club's history. But it was more about the varying emotions felt in the game which led to difficulty in interpreting the result. Pompey were under siege in the first half but made it to the interval without conceding. They were much better after the break with Gareth Evans seeing his efforts kept out by Marek Marosi, before the keeper was sent off for handball outside the box. 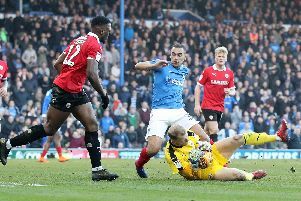 Pompey not really testing makeshift keeper Ben Whiteman was frustrating, but in the final analysis this is a result which maintains momentum.